Western Blot analysis of human brain tissue lysate. 30 µg of human brain tissue lysate was run under reducing conditions on SDS PAGE using the Bio-Rad V3 system and transferred to a PVDF membrane. Bio-Rad Precision Plus molecular weight marker was run in lanes 1, 3, 5 and 7. 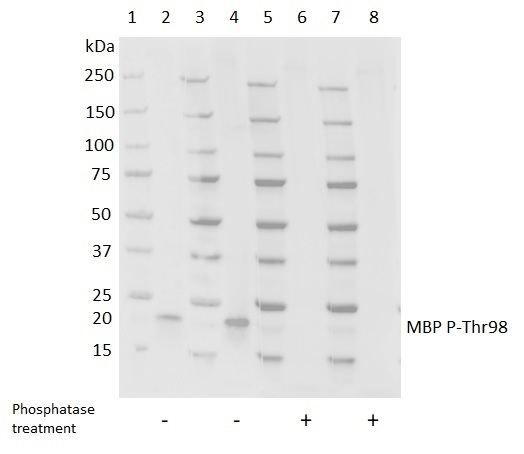 Mouse anti MBP P-Thr98 antibody (MCA1577) was used as the primary antibody at a dilution of 1/500 in lanes 2 and 6 and at 1/1000 in lanes 4 and 8. TidyBlot Western Blot Detection Reagent:HRP (STAR209P) was used as the secondary reagent at 1/200. Membranes were treated with (+) and without (-) phosphatase and visualized on the ChemiDoc™ MP Imaging System. Mouse anti MBP (pThr98) antibody, clone 98P/12 recognizes myelin basic protein (MBP), also known as myelin A1 protein and myelin membrane encephalitogenic protein, when phosphorylated at threonine 98. The numbering of the threonine residue refers to UniProt entry : P02686-5. Myelin basic protein Isoform 5, a truncated form of MBP lacking the N-terminal residues. The equivalent threonine in the canonical isoform 1 is thr232. Synthetic peptide from human myelin basic protein sequence, phosphorylated on threonine 98 with the sequence FFKNIVTPR(pT)PPPSQGK. Yon, M. et al. (1995) Preparation of a novel monoclonal antibody specific for myelin basic protein phosphorylated on Thr98. J Neuroimmunol. 58 (2): 121-9. Yon, M. et al. (1996) Identification of a mitogen-activated protein kinase site in human myelin basic protein in situ. J Neuroimmunol. 65 (1): 55-9. DeBruin, L.S. et al. (2005) Developmental partitioning of myelin basic protein into membrane microdomains. J Neurosci Res. 80: 211-25. DeBruin, L.S. et al. (2006) Partitioning of myelin basic protein into membrane microdomains in a spontaneously demyelinating mouse model for multiple sclerosis. Biochem Cell Biol. 84: 993-1005. Boggs, J.M. and Wang, H. (2004) Co-clustering of galactosylceramide and membrane proteins in oligodendrocyte membranes on interaction with polyvalent carbohydrate and prevention by an intact cytoskeleton. J Neurosci Res. 76: 342-55.